Honda Car India Limited has officially launched its first multi purpose vehicle in the automobile market. This is a mid-size vehicle, which comes with a seating capacity of seven people. 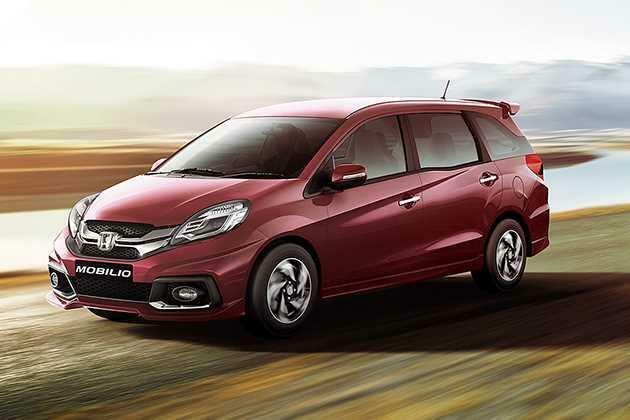 It is available in four trim levels out of which, Honda Mobilio S i VTEC is a mid range petrol variant. It comes with a 1.5-litre, i-VTEC petrol power plant that has displacement capacity of 1497cc. It is based on a SOHC valve configuration and coupled with a 5-speed manual transmission gear box. It comes with a spacious internal cabin, which is designed keeping in view the comfort and convenience of its occupants. It is beautifully decorated with a single tone beige color scheme that gives a refreshing look. There are well cushioned seats incorporated, which are covered with cloth based upholstery. Some aspects like key less entry, interior cabin lights, central locking, vanity mirror and a few others add to the comfort levels of its occupants. This MPV comes with a dynamic body structure and has a sporty outer appearance. It includes various interesting exterior aspects like a bold radiator grille, body colored ORVMs, rear micro antenna, body colored bumper and a few other features. It comes with a warranty of two year or 40,000 Km, whichever is earlier. This stylish MPV has an overall length of 4386mm along with a width and height of 1683mm and 1603mm respectively. It comes with a ground clearance of 189mm and a wheelbase of 2652mm, which indicates a roomy cabin inside. The car maker offers it in seven attractive color options for the buyers to choose from. The list includes Carnelian Red Pearl, Majestic Blue Metallic, Brilliant Gold Metallic, Alabaster Silver Metallic, Urban Titanium Metallic, Taffeta White and Crystal Black Pearl. This variant has a sporty external appearance and comes with a lot of stylish aspects. To start with the front, it has an aggressive radiator grille that is treated with a lot of chrome. Surrounding this grille is a trendy looking headlight cluster. It is integrated with powerful halogen headlamps and turn indicators as well. There is a wide air intake section below the grille, which is fitted with a body color bumper. It also includes a wide windscreen and a slanting bonnet which completes its front profile. The side profile appears quite attractive with features like body colored outside rear view mirrors, door handles, B-pillars with black sash tape and wheel arches fitted with a set of steel wheels. Coming to its rear end, there is a radiant tail light cluster, large boot lid, a wide windshield, rear micro antenna and a bumper in body color. This Honda Mobilio S i VTEC is blessed with a spacious internal cabin that gives enough leg room to its occupants . The manufacturer has given it a beige color scheme and incorporated many sophisticated aspects. It comes with a neatly designed dashboard that further houses a center console, instrument cluster, air vents and a three spoke steering wheel. It is bestowed with comfy seats, which are wide and covered with premium fabric upholstery. The driver's seat has height adjustment function, while the rear reclining seats can be foldable. The advanced 2-DIN audio system is one of its highlighting aspects. This unit features AM/FM radio tuner, Auxiliary input, USB port, MP3 player and has speakers as well. It is incorporated with a power assisted steering wheels that is mounted with audio control switches. The silver finished steering wheel, chrome plated gear shift knob as well as air vents further brings an appealing look to its insides. It is powered by a 1.5-litre, i-VTEC petrol engine that can displace 1497cc . It comes with four cylinders, sixteen valves and is based on a single overhead camshaft valve configuration. This commanding power plant is integrated with an electronic fuel injection system. This helps in returning fuel economy of about 17.3 Kmpl, which is quite impressive. This mill is skillfully coupled with a five speed manual transmission gear box that further improves its performance. It has the ability of producing a maximum power of 117bhp at 6600rpm and yields a peak torque output of 145Nm at 4600rpm. The top speed achieved by this vehicle ranges between 150 to 160 Kmph and it consumes about 13 to 14 seconds to cross the speed mark of 100 Kmph, which is quite good. This trim comes with a proficient braking system where its front wheels are fitted with a set of disc brakes and used sturdy drum brakes for the rear ones. On the other hand, it comes with a proficient suspension system, which helps in maintaining the stability of vehicle. The front axle is affixed with a McPherson strut, while the rear one gets a torsion beam type of mechanism. It is incorporated with an electric power steering system that is collapsible and tilt adjustable. It supports a minimum turning radius of 5.2 meters and results in an easy handling. This Honda Mobilio S i VTEC trim is blessed with a number of comfort aspects, which gives a pleasurable driving experience. There is a day and night inside rear view mirror, central locking, key less entry, ECO lamp, cup and bottle holders available . There are all four power windows available with auto down function on the driver's side. The front passenger seat comes with back pocket where occupants can store small things in it. It has a latest air conditioning unit which comes along with a heater. Apart from these, a few more features include two interior cabin lights, dual horn, head light off reminder, ignition key reminder, tachometer and low fuel consumption display. The mid range variant is loaded with quite a few safety aspects for the security of its passengers. This list includes an Advanced Compatibility Engineering (ACE) body structure, impact mitigating headrests, engine immobilizer, driver seatbelt reminder, LED high mount stop lamp and has pedestrian injury mitigation technology . 1. Quite a number of comfort features. 2. Sleek bodyline with captivating external aspects. 1. Mileage can still be worked on.